XMPP Manager is an optional menu item. In order to have the option for XMPP Manager there are a few step to take to enble XMPP. Click the plus on the right to create a profile. In this example we will setup Google Talk and by creating a profile called gtalk. Two approaches can be used for the next part. Lets say my gmail number was 13051231234. This approach will send the inbound calls to the inbound routes with a destination number that is the default extension number that is set. On a single tenant system. This will send the call to extension 1001 in the default context. On a single tenant system. This will send the call to extension 1001 in the multi-tenant domain name. Save the settings and restart the module. Restart the ‘XMPP’ module from Advanced -> Modules page. Go back to Accounts -> XMPP if the status says ‘AUTHORIZED’ then you are ready to go. Note If you are not getting AUTHORIZED you might need to goto the google account settings and choose “Allow less secure apps: ON” under the Sign-in & security section. For this example we will use 11 digit dialing. If your XMPP profile is named something other than gtalk edit the outbound route you just created. Bridge statement should look like: dingaling/gtalk/+$1@voice.google.com replace gtalk with the profile name you chose and then save it. 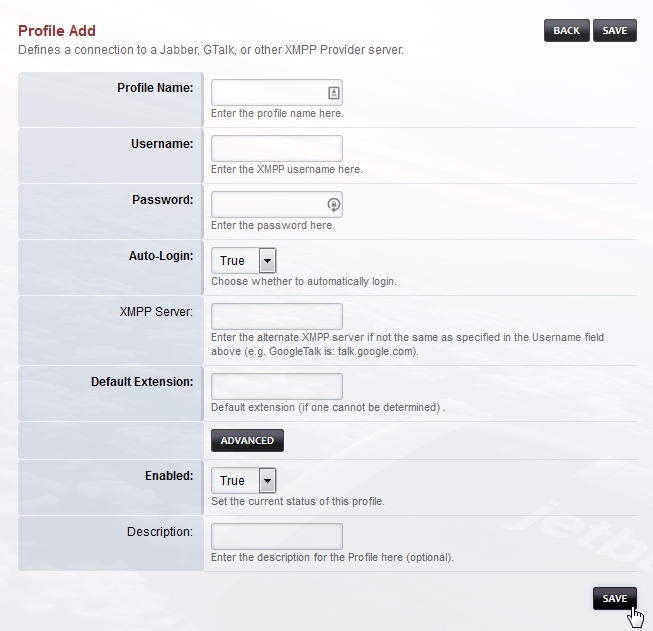 XMPP manager is used to configure client side XMPP profiles. It can be used as a client to register to make and receive call with Google Talk or other XMPP servers. You should now have XMPP Manager under Accounts.